Thread: [Official] How To: Where to start when you're new? So, you wanna be a manager, huh? Since we did a revision of the Tutorial that all fresh managers go through when they first establish their clubs, we thought that it would be great to follow that revision with a forum mini-guide. Here we will talk about the main tools with which you, as a Manager, will be able to operate your Club. We will make note of specific things that you should be mindful of when you're just starting your career. In other words this is your your Starter guide. After all, you can learn how the interface operates and how things work but the rest is experience. So, lets give, you fresh green managers, an experience boost then huh? At this point you've noticed that there are a lot of menus in the game, some of which - The Finances menu, the Squad menu, the Transfers menu, and especially the Home Screen, where you'll usually start off from. Which is also the menu where you will find your Assistant who's providing lots of relevant information on what's going on in the rest of the Club (Menus). - Sending and Claiming gifts. - Expiring player contracts; Player injuries; Penalty cards. - Tells you if the scout found new players; What players you've transferred to and from your team. - Club debt; TV Rights contracts; Sponsorship contracts. - What's being built and how long till it's finished, as well as how long till you get boosters and youth players from their respective facilities. More on this in the Ground section below. Additionally the Home screen provides info about: The upcoming match, the previous match, which day of the season is and what's your standing in each of the competitions (Both are under the Assistant button). Now, you've noticed that you have started with a good amount of Tokens, cash and boosters. Don't squander these, Manager! Don't rush in to the game but rather, get your bearings, play and observe a few matches and most of all, if you are looking for winning strategies you better stay here in the forum and discuss the game with the rest of your fellow managers. Lots of good tips, strategies and tactics discussions are going on in the Tutorials and Guides forum. But the question of "How exactly would I overspend my starting resources anyway?" hangs. Well, you will start off with a club that has a decent starting line-up of players, good enough to keep you afloat and even beat the competition as you learn and get used with everything. But you would eventually want to try and find some new star players for your team, some fresh talent. If so then you should think about hitting the Auctions. But be warned - You will most likely face other managers on the Auction. A lot of times auctions can prove a cheap way to acquire new talent for your Squad, but you may also end up against a very persistent manager, too. And that may be costly. When you find a player who's up to par with your requirements, you select his name and his profile will popup. Here you can find further details about the player such as Stats, Skills, etc. From the Offer's tab you will be able to place a bid. You can find out if anyone else has placed a bid for the Player. Who ever has the highest bid for the player after the 4 Minute timer runs out takes the player. Also keep in mind that you won't lose your tokens if you lose the auction. Two other options await you in the Transfers - The Scout list and the Negotiations. Meet the Scout - This list updates 14 times per season and will always offer players that are 6* (Or 100% and more capability for the level of your club). At 120% the player will gain a 7th star. The most expensive players in this list will be around 4% away from reaching this 120% mark. The Scout list players are pretty good for you, if you just have to fill out that gap in your squad, or if you simply want to get a big boost to your team and outfitting it with several of these players. NOTE: Chose your initial offer carefully. If you wish to increase your offer after this, 1 token will be deducted from your balance - These tokens are not refunded! Overall you should be picky about the players you try to acquire. Other than the obvious things such as: number of roles, type of ability, cost in cash and tokens for the players, you should also be mindful of their age. Long time managers in Top 11 have started to devide players in to Young and Old. These young and old players (relatively speaking) and each have their own perks and drawbacks depending on your strategy for the season or the next several seasons. Young players (18 years till their early 20s) are fresh and ripe for learning and you can shape them the way you want through training. They are a long-time investment basically. Old players (In their mid-20s and older) have lots of experience in the sport and even though with the passing of the years (Seasons) they slow down in their development, they are good professionals and some carry huge potential still. Many times they also have expertise in more than a single role and even come with an ability to boot! Depending on the Manager's style of play and strategizing, old players may either be: A short-term fix or the actual backbone of the team. We should have talked about the Squad menu before the Transfers but because a lot of new managers tend to dive head-first in to the Auction, Scout and Negotiations I thought we would do well to change the priorities a bit. So with that out of the way - The Squad. Think of this menu as your command center. From here you will get full details about anything that has something to do with your players, your line up, your tactics and strategy. Not to mention that from here you can check out each player's personal profile, and that's something that has a lot of weight on your decision making when doing transfers! This tab shows details such as: Player position; Name; Age; Contract length; Wage; and others. If you select the drop down menu "General" you'll be able to switch to "Stats & Skills". There you'll find info such as: How many matches each one has played; How many goals they've scored, etc. Here you can check out the formation of your team, each player's Morale and Condition rating and how many stars their quality is worth in regards to the level of your Club. You'll see if any of your players has a penalty card. Formation can be changed by selecting+holding a player's jersey on the pitch and dropping the jersey on the preferred role box. After you've decided what formation to use for the upcoming match you can spice up your strategy by going to this tab. You have four options for Attack and four options for Defence. There is synergy to be had between formation and tactics so test out the waters and try to mix things up and see how your team performs. You'll find a lot of strategic assistance here in the forum so share you thoughts and questions with your fellow managers! 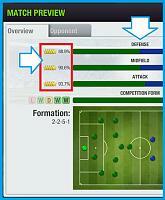 NOTE: Select the button next to each tactic for some details. So we spoke about players, transfers and generally things that will cost your club Cash. So it's time to say something about keeping all of that spending in check. Keeping track of your Club's treasury, is of utmost importance - If you neglect this aspect of the game and go all out spending, you may find your self in a debt. But hey, the Finances overview also informs you of all the earnings your Club does! - Selling your own players - Directly, through Auction or if any other manager places an offer for them. - When you are the Home team you play at your own stadium and visitors have to pay for entry. - The Utilities building in the Ground menu will be the place where visitors of your home matches will be able to buy club merchandise. - These are contracts you sign with sponsorship partners. They reward you with cash. - You can check how much you will earn per win by going to any specific competition's menu and opening the blue Rule book in the top right. TV Rights - Here you can sign contracts that will generate Tokens for your Club for free. Additional contracts will unlock as you level-up. Each contract has a different rule set so read them carefully - It costs tokens to cancel a contract before it expires. Sponsorship - Here you can sign contracts that will generate Cash for your Club, again for free. Additional ones will unlock as you level-up and just like the TV Rights, each contract has its own rule set. Read carefully! Tickets & Bonuses - This panel lets you decide how much you'll be charging for Tickets when fans visit your stadium for home games. Additionally you can decide if you would like to offer a cash bonus to your team in the case that you win the match - This is basically a way to incentivize them to push them selves even harder during the match as you will divide the cash prize among the main 11. There is a separate bonus for each competition. The Friendly and F.A. matches share the same bonus. From here not only can you build a stadium for your club but then you'll be able to upgrade the various modules of said stadium. - This building generates Rest boosters for your club. Zooming in on the building will tell you how long till the next batch. - This building generates Treatment boosters. Zoom in to check when will you get your next batch of red boosters. - As we already spoke in the Finances section - This building sells merchandise to fans who visit your home games. Upgrade it to increase it's output. - This building is tightly intertwined with the seat capacity of your stadium. Your stadium might have 100000 seats but if people have no where to park their cars, they won't be able to come and enjoy the game. Keep this place upgraded adequately for your Stadium's capacity! - This is the facility in which young and aspiring players train. After a certain period of time (The higher the upgrade, the less days it takes for the next 2 youths to arrive), 2 youths will appear in your Squad. Your assistant will notify you of this in the home screen. One of these players is free of charge while the other will cost tokens when you sign his contract - Keep that in mind. The segments of the game that we covered here are your toolset with which you can manage every important aspect of your Club, with which to assure that your Club will last and maybe even achieve some accolades! You are the person in charge, Manager. Your players and the fans of your Club are looking up to you to make sure that they can continue to enjoy this great sport and live out a successful and fulfilling career! Do your best. Still, you are not alone out there. This very place, the Top Eleven Forum, is one of the riches sources of information you will find out there. Take this to your advantage. By the way you can also reach support through the mobile app - Open Top 11 and then tap the Home button in the top left. Then tap the "?" button in the bottom left. GOOD LUCK IN THE COMPETITIONS EVERYONE! Voldara, Duncton, khris and 2 others like this. "Prior preparation prevents piss-poor performance" The five P's of success! Before heading out to the stadium you should first gather some info on the upcoming match. In time you'll notice that some matches might hold higher priority to you than others depending on the competition they're in and your team's standings. This is part of your job as a manager. Top Eleven, being a management game, is about strategically handling your resources as much as it is about leading your team to victory! So first lets see when exactly our next match is going to be. Go to the "Home" menu. The latest match you'll have to play will be displayed there as seen in the image below. You can also go to the "Fixtures" menu. Over there you'll see a full list of your team's fixtures. League fixtures are scheduled right on the 3rd day of the season while fixtures for other competitions are added depending on placement and other factors. HOME & AWAY If your team's emblem is on the left you'll be the Home team and the match will be played at your stadium. This means you'll get some sweet cash from all the tickets you sell! The emblem on the right, therefore, is that of the Visitor team. ⚽ Important! Additionally, if you're Home for a particular match, you will have the ability to reschedule the time of said match. To do that go to "Fixtures", find the match you wish to reschedule and select the pencil button of the particular fixture as shown in the image below. Now that we have the date and time of the event let's proceed ahead in a step by step manner. You gotta know what your opponent is going for and with what, a.k.a. what's the composition of their team, what players does it have. And this is exactly what we'll start off with. MATCH PREVIEW | Select the "Match Preview" or VS button in the home menu, or the actual fixture in the "Fixtures" menu. This will bring up a preview of the match. Here you'll see a comparison between the Defence, Midfield and Attack capabilities of both teams (Which are calculated from the Starting 11 players of the squad), as well as the competition form of each team (This is the outcome of the club's 5 most recent matches). At the bottom you'll notice a pitch with the two teams in their current formations. OPPONENT PREVIEW | Selecting the emblem of any club, anywhere in the game, will open up that club's profile. The profile compares various statistics about yours and their team. What we're looking for here though, is the Squad tab, for under that tab you'll see the opponent's full roster of players with all their stats, skills and quality. See image below. Club Level: Strength of teams is relevant only to the Club Level. This level can be different from the Manager Level but it's of no consequence. Also, Club Level is always the same as the level of the League. Having all this data we can start predicting what kind of strategy the opponent might be going for. The main points being, what their formation is and what kind of players are positioned where. ⚽ Here's a tip from us: Take a good look at your opponent's formation. Some formations offer an attacking edge or increase the defensive strength of the team, and others could be employing more players to the midfield which increases the team's ball possession. ⚽ Important: All this, of course, takes time to get used to. Don't fret if you just can't figure out what the opponent might be going for. It takes experience and a few matches under the belt to get to that point! Additionally, since you're already on the forum, you can always ask the veterans here for advice or search already existing threads. The managers here on the forum are some of the most long-time players that Top Eleven has seen and they know the game in and out. So take a look at the Tactics and Guides forum. 4-5V-1 - This is an attacking formation offering some good defence together with ways to counter from the flanks. 3-5-2 or 4-5-1 - Both of these variants promote a possession game for your team. The more players you have in the midfield the greater your ball possession will be. 4-4-2 - A nicely balanced formation, offering coverage of the field which lets you try different approaches during the match without changes to the actual formation. Lastly. Formations go together really well with the team's "Tactics" options. We'll talk about this below in the "Setup your team" section. But it's important to mention that you can't view your opponent's tactic choices. This is what we were talking about when saying that "Being able to figure out your opponent comes with experience", and observing their formation is the key element from which to judge on how their Tactics are set like. Now lets shift the view to your team. Here we'll see what's actually going on under the hood. And knowing how the engine of your team works means you'll know how your opponent's works. Lets go to the "Squad" menu. There are three tabs here - Lineup; Formation; Tactics - For this exercise we'll only take a look at the last two. FORMATION TAB: As seen in the image below, both ours  and the opponent's  players are visible in their current formations. This is really useful since you won't have to jump back to the match preview while setting up your formation. 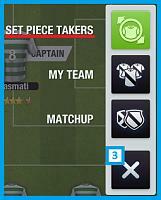 Don't forget to appoint your team's Set Piece Takers! To do that select the button  in the bottom right corner and then the Set Piece Takers option. Additionally, if a match goes to a penalties shoot-out due to a draw, you will be prompted by the game to pick your penalty takers. If you don't pick new players, the game will simply go with who you chose before the match. Every player is proficient in certain roles that correspond to their namesake zones on the pitch. When you select and hold a player, a dotted line (Red Arrows) will show what the player's roles are. - If the position is only similar to the ones he knows. - If the position vastly different than the ones he knows. This "performance hit" will be signified by an orange/red cone, respectfully. The distance between players is directly interpreted by the system. This means that if, for instance, your player is right on top of an opposing player, he is basically covering him and vice-versa. The two will be in conflict with each other and the system will take into account. This can be helpful for when you're trying to defend your flanks with a DML or DMR for example. The game will warn you if your formation is unbalanced (Symmetrical presence of players on the field) or is lacking players-presence somewhere. Example: If you have more than 3 players in a zone the game will tell you that the zone is crowded and that players require more space in order to play well. To see the warning just select the exclamation mark button. 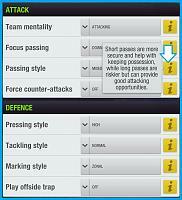 TACTICS TAB: There are two categories here - ATTACK and DEFENCE - Each with 4 toggles with several option. These toggles let you influence the mentality and behavior of your team. For instance you may order your team to go for the offensive or defensive play, to go for short passes in order to keep ball possession, or even instruct your defenders to be hard with their tackles. Note: If you select the yellow "info" button next to each toggle you'll get a hint as to what the options do. What ever you chose, chose carefully and have an overall strategy for the match in mind because these options here can offer some very powerful advantages if you supplement them properly to your squad's current setup. Players | 4 Defenders, 1 DMC to close up the hole in the middle, and 4 players in the midfield forming a wedge toward the flanks of your opponent with an ST waiting for a pass or keeping the defense line busy. Strategy | Lets take control of the ball on our side of the pitch and then counter toward the flanks. Why? The opponent has set up camp on our side of the field, so we can't even get to the middle and make some plays of our own. So, lets get aggressive with the defenders, get the ball back. Then, push it fast toward the middle-and-flanks, with counter attacks and the wedge of the formation. Tactics | And now lets set the toggles following the strategy we have in mind. Jeeves: This is actually one of the matches I played recently. Beat the opponent 3:2. Opponent was playing with a 3-3-2W-2. I tried to go for attacks in the first half but couldn't pass the midfield, the opponent was now taking potshots at my goal line. Eventually they scored once and then twice and then it was the end of first half. Second half came. I decided to risk it with some counter-play and hopefully get a draw at least. Match was for the Cup's quarterfinals. A draw would make us equal on aggregate and I intended to cross my fingers for a chance at penalties. Instead? Haha, my defenders were always beasts but jeez, they got the ball in return for two yellows and then the tides switched. My guys completely stormed the other team. 1. Long ball to my AML, then a pass to the ST - Goal! 2. DMC gets the ball, rushes forward, pass to left MC, MC long pass to ST, defenders try to intercept, ST pass to AMR - Goal! 3. Left MC receives a pass, right MC gets close and they tiki-taka toward the left flank, shoot, ball is intercepted by defence, AML storms and takes the ball, pass to AMR, shoot - Goal! Preparing for a match is just half of the work done. Playing (and winning) the match is the other! Advice: Always check your opponent minutes before the match begins! Some managers tend not to show their hand and might even scramble their team only to set things up only minutes before the start. On that note: You may apply changes to your team up to 3 minutes before the start of a match. After that its time for both teams to assemble on the field so the options will be locked. And once the first whistle blows it's time for action! MATCH SIMULATION: Everything runs on the official game servers. This means that no player can dabble with the game code and essentially hack their opponents. Your computer/device is but an interface with which you control your team. Basically your device is the benches from which you observe the match and signal your team and the server is the actual football pitch on which your team plays. The system will be matching and comparing the statistics of both teams, pitting players against each other. Plays will occur and those will be shown in 2D on the pitch. The calculations that go in the background are numerous and complicated but suffice to say players' roles, abilities, attributes and skills, as well as everyone's positioning on the pitch and when in time that is, are all taken into account to build sequences of events that may or may not lead to plays and even goals. 2D ANIMATION In case there are interesting situations or plays that are happening the 2D animation will fire up and give you a visual representation of whats transpiring. Pay attention to this as its one of you best tools via which to tell of your opponent's team mentality and tactics! Important: The 2D animation may be switched off from the "Settings" menu's "Live Match Animation" toggle. In that case you will receive a live text commentary instead. JUDGING THE SITUATION So, what now? Well your job as a Manager is to supervise your team and make swift changes if/when the moment is right/requires it - Be it, changes to the formation, the tactics or even substituting a player who has a yellow card so as to protect him from turning that yellow in to a red, after another yellow booking. You are the strategist! Note: You have to switch between teams by selecting the emblem button. Top right corner. Match Highlights | A timeline of important events like Goals, Bookings, Corners, etc. Take notice of which players are scoring the goals. Can help you determine if you should pressure them by putting one of your players near them or bolster your own offence. Match Statistics | Probably your most important tool in this list! Take heed of stats such as - Possession; Total Shots; Shots on Target; Shot Efficiency; Passes completed - These values can give you an idea whether or not your formation/tactics are working properly against the opponent or not. Note: If the statistics aren't updating (values stay at 0), just switch to another menu and then back to the live match. That makes the local client re-update itself with the information from the server. Team Bonuses |These bonuses are raised when the team trains. They constantly provide their % value to the team during a match, and can even be activated for half of the value added on top of the base value for 20 in-game minutes. Example: Activating 8% attack will make the bonus into 12% for 20 minutes of the match. Important: You can always remind yourself how bonuses work during a match by selecting the yellow "Info" button in the top right corner. Well, this is pretty much it. You have the tools a boost to your knowledge and now all you need is practical experience. So, gather your team, set up realistic goals for the club and update them as you get better. And start collecting the head... ah, I mean trophies of your opponents! Lex and rafaeljec like this. I. Cash, Boosters, Tokens | How're they used and how you can get more. III. Gifts | What are they and what types there are. IV. Friends | In-Game & Facebook friends, what are the differences. Also, Referrals! V. Friendly Match | What you should know about this mechanic. VI. Account Linking | Multi-platform accessibility. Top Eleven is an expansive game with a plethora of systems that work and operate in the background. All these systems and their mechanisms are the gears that the game runs on. Most are actually part of major game menus (e.g. Squad, Training, Ground, etc), but others are on their own or are visible/usable in most or all the menus. It's exactly these separate game elements that aren't a part of a major family that we'll tell you about in this article. Used for: Cash is used in the acquisition of new players, paying their wages, and for the construction of buildings in the Ground menu. Furthermore you may offer a win bonus to your players (For each specific competition) which will be paid out and divided among the players which participated in the match. Earned from: Signing contracts with sponsors. Done through the "Finances" menu's Sponsorship tab. These are used to renew/regenerate specific statistics of your players. There are four types of boosters: Treatments; Rest packs; Morale boosters; Skill points. These can be earned through various means in the game. Used for: Treatments are used to treat any injuries that you players might have. Earned from: Fair play during a match (i.e. None of your players have been booked). You get +1 Treatment. Generated from: Medical facility in Ground menu. Used for: Rests are used to regenerate the condition of your players. Earned from: Making at least one substitution during a match. Generated from: Training facility in Ground menu. Used for: Morale boosters are used to raise the morale of your players. Earned from: You get 1 booster for Attending a match, Winning a match, Dominating a match (Beat the opponent with a score difference of 5 or more). Deducted for: Losing a match. Used for: To increase a player's attribute(s) by 4 extra percent. Earned from: Opening the Skill Point gift that you may receive once per day from your friends (See GIFTS below). Used for: The acquisition of new players for your club as well as speeding up the upgrade process of any building you might be constructing in the Ground menu. Earned from: Signing TV Rights contracts with sponsors. Done through the "Finances" menu's TV Rights tab. Also from selling your players through Negotiations. Also from reaching divisions in the Football Associations competition. You also have the option to purchase cash, boosters and tokens from the in-game shop. This can be done either by going to the Club Shop menu or selecting the respective items of interest from the club resources gauge in the top right corner of the interface. Additionally you may watch videos to earn cash and boosters as well as completing specific offers provided by our advertisement partners (Offer Providers). Videos | To watch a video simply click/tap on the cash or booster you want in the top right corner of the screen and then on the "Get Free" button. Note: Videos may not always be available. Availability depends on the offer providers as they are the ones who supply the video adverts. Read more on the subject here. 1. Mobile - Select the Token gauge in the top right. Then Free Tokens. 2. TopEleven.com - Select the "Win Tokens" button. 3. Facebook.com - Open the Token gauge in the top right. Then select "Win Tokens". Each time you will be given a list of available providers. Pick one. You will be redirected to their Offer-Wall and you'll see what offers are currently available for you. The Offer-Wall element is important because if there is a technical issue with any of the offers that you complete you'll have to contact the offer provider through their offer-wall. This feature lets you earn a little extra every day by simply logging into your club. 1) You can see the reward for each day. These rewards change on a weekly basis but there will always be at least 2 days that reward Tokens. 2) The moment you log in you'll receive the reward for the particular day. After that you'll be asked to pick one of 3 mystery cards. There's a total of 5 different cards that can be hidden under A, B and C, one for each reward type: Cash, Tokens, Moral boosters, Rest packs, Treatments. 3) This feature rewards dedication so you should log in every day to get all the rewards for the given 7 days. If you miss out on a day, you'll have to start again from day one and the rewards for each day may be different. Found under the Assistant's menu in the Home screen, Gifts can be sent between friends once per day. There are four gift types: Treatment, Morale booster, Rest pack. Skill booster. Note: A manager may pick up only one of each per day, regardless if how many of their friends send them one. How To | To claim/send/request gifts open the Assistant Menu in the Home screen. Select the gift you;re interested in, and if you haven't received one yet you will be able to request the type of gift from the friends you select. Naturally if your friends sent you a gift, selecting the gift will have your club acquire it. Example image on the right. ⚽Skill Boost | This gift , when claimed, will pick one of your players at random and allocate 4% in one of his attributes. The selected player's name will be displayed on top of the pop-up window you get once you claim the gift. Note: These 4% will always be added to a player's attributes and not into any role/ability he might currently be training. Other than the social aspect of things, friends are nice in that they all receive a notification in the bottom left corner of their screens whenever you start playing a match. This way it’s more probable to have additional support during your match. Furthermore the “Fixtures” menu has an extra tab specifically tracking upcoming Friend matches. Note: All your friends are displayed in the Friends list located in the Home screen. There are two categories of friends in Top Eleven: In-game friends & Facebook friends. These are people you've befriended while playing the game. This is done by sending a friendship request to another manager. To send a request just open the profile of any particular club/manager and then select the "Add Friend" button in the top right corner. The other manager will receive a notification in their inbox and can either accept of decline your request. Note: You can only send a request to managers from your own server. People with whom you're in the same competition groups will always be on the same server as you. These are your friends from Facebook who play Top Eleven. Those of your Facebook friends who haven't created a Top Eleven account through their FB profile can be invited to become your referral.. If you send an invite to one of your Facebook friends who never played the game through their profile, they will become your referral. There are specific referral achievements that, once fulfilled will net you one or more free tokens. Some of these achievements have several stages too. 1) Go to the "Manager" menu. 2) Switch to the "Referrals" tab. 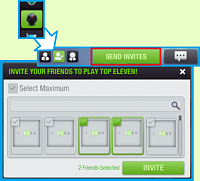 3) Select the "Send Invites" button. 4) Pick the friends you wish to invite. To invite someone to a friendly match, go to the "Home" menu and select the "Friendly" button. After that, select your opponent and set the time of the match. 1) Whoever invites their friend to a friendly will be hosting the match at their own stadium. 2) Friendly matches can be canceled by either side if more than 3 minutes are remaining until the start of the game. This is done by selecting the "X" button for the friendly match in the "Fixtures" menu. 3) Only the home team will be affected by the match. This means that players will lose condition, their moral can be affected, and even injuries may occur. The visitor team will not be affected in any which way. You may not know it yet, but you can actually link your Top Eleven game account to several social networks. This grants you access to your account through other platforms. Settings menu > Accounts tab. There you'll see what options are available to you. Note: Depending on what platform you currently play on, these options may vary. If you'd like to learn more about Account Linking we highly advise you to read the expanded guide on the subject by following this link.